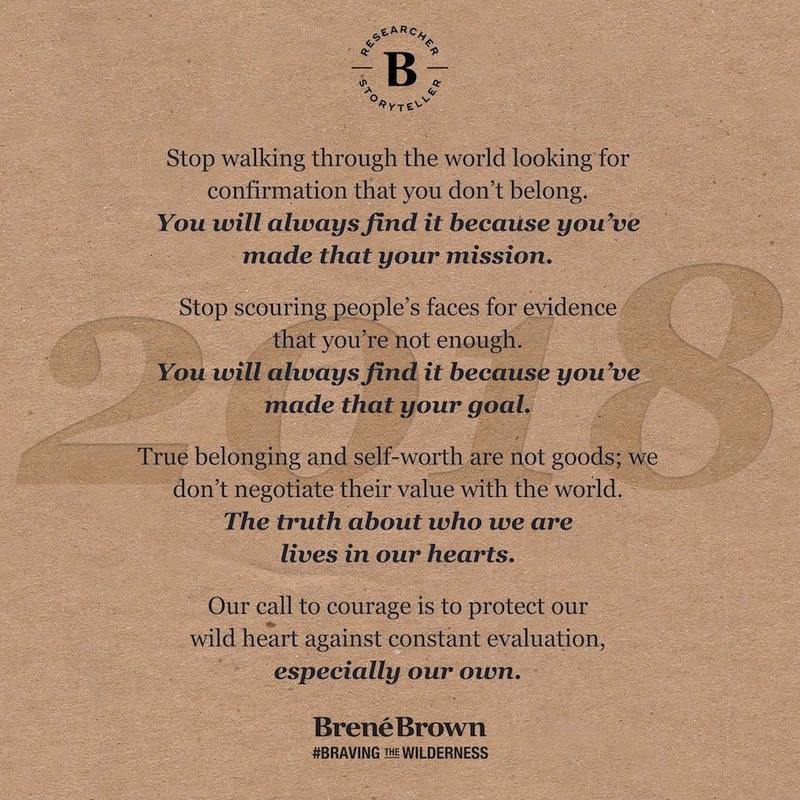 I think that Brené Brown‘s words are the perfect words for me to start off my 2018 blogging. I’ve looked at, and had to look at, the experience of belonging (and not) a lot over my 56 years on this planet. Belonging has been a constant theme in my life and it was all too often a painful and lonely place where more often than not, I felt excluded and left out, rather than experiencing that blissful state of belonging. Don’t get me wrong, I have had some beautiful times in my life, with deep friendships and intimacy and I know what belonging feels like, that is for sure. However, often I have had either a great life with a full plate of friends or a blank slate wiped clean, starting all over from scratch over and over again. There was rarely a middle ground, but an all or nothing friend world for me. So I have been thinking a lot over the years, that the people who have inspired me the most throughout my life are those friends who are friends with everyone; OK, maybe not everyone, but anybody they meet is and can be a friend, even if only for a moment. If I am a friend to all, there is no need for a best friend as I believe that it’s possible to have several soulmate friends if you are all open to it. As quickly as I have craved it, just as quickly I have realized that by having a “best friend” it excludes those friends who aren’t that for you and places a hierarchy on humans, excluding some while elevating others to the top. Yes I know that I’m exaggerating as having a best friend can be a wonderful feeling (I hear) but for me, for now, fitting in means that everybody else gets to belong too. In being a friend to all who come my way, I belong nowhere and I belong with everyone. Our planet needs for us to reign each other in right now, leave no one sitting on the other side of the fence alone, on the outside looking in, whether best friend, one or many friends … we all belong with everyone. So there we have it, my first writing experiment for 2018. Let’s do 2018 together, shall we?